Summer’s over. Everyone has finished their summer vacations. Students are back in class. The cold will be here before you know it. I actually love winter. While it rarely snows here in Florida, it still gets cold. Since I was a child, I have always loved to wear winter clothes. Another reason I like winter is because as far as website traffic goes, usually he last 4 months of the year see an increase from the slow summer traffic. Everyone is away from their computers, and getting ready for classes to begin. August traffic was great. However, it was 60,000 page views away from reaching July’s traffic. Honestly, I am not surprised by it. Paying attention to websites for as long as I have, you tend to notice trends like this. So now to the raw stats. 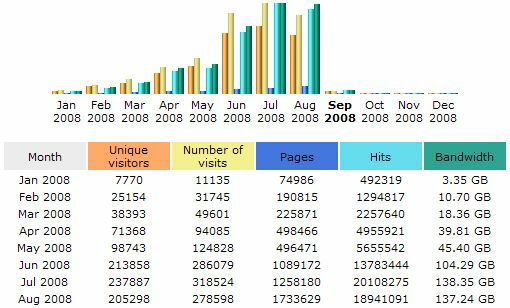 August saw a total of 205,298 uniques and 338,800 pageviews. RSS subscribers have held steady at around 520. 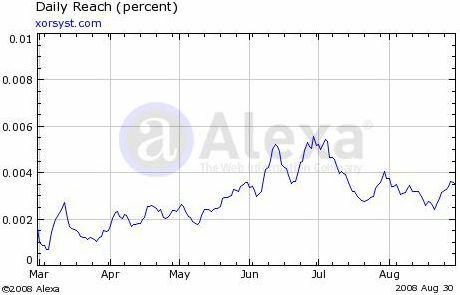 Alexa rank is holding steady at 35,877. Stumbleupon performed great this month as well. Thanks to everyone that liked the articles through Stumbleupon! Special thanks goes to Fallensieg, EscapeTheory, Sanjo-chan, and Sircell who took the initiative to submit my posts to Stumbleupon as well as stumble others. Thanks so much. Be sure to add them to your friends list! 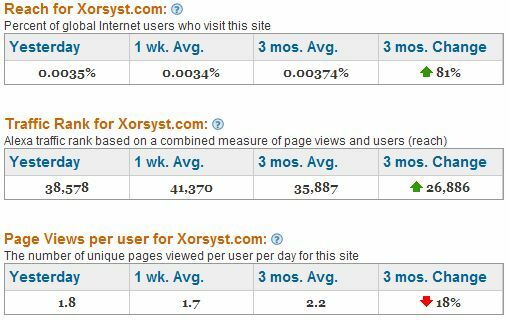 If you havn’t stumbled the front page yet, be sure to do so too, and help spread xorsyst.com to as many new people as possible! Last month, Dannychoo posted a comment saying that he doesn’t even pay attention to Alexa anymore. For July I had reported that I had a bit of odd results. Now, I am starting to side with Danny as the more and more I read about Alexa’s latest algorithm changes being totally off. While the only reason I pay attention to them is that many advertisers still use them as a basis to choosing whether or not to advertise on a particular site. One of the things I have been working on and off for a couple of weeks now is launching a redesign of my portfolio site. You may wonder what I do besides this blog. Well now you know. On LPonder.com don’t expect a post everyday, but I hope it will offer some insight into some of my other projects that I have mentioned talking about in previous stats posts. I’m a web designer, so its mainly about topics such as social media, SEO, my projects, and whatever random ideas that pop into my head. It’s still a work in progress, but hey, isn’t any site?